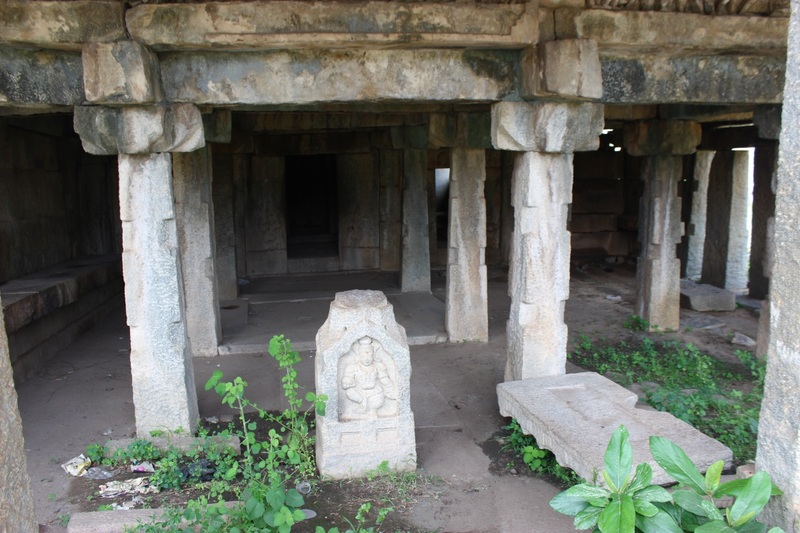 Varaha temple is about 250 meters east of Kodandarama temple. In the background is Matanga Parvatha. At the foot of the hill is Ahyuthraya temple and at its summit is Veerebhadra temple. The temple is east facing and has a large gateway. 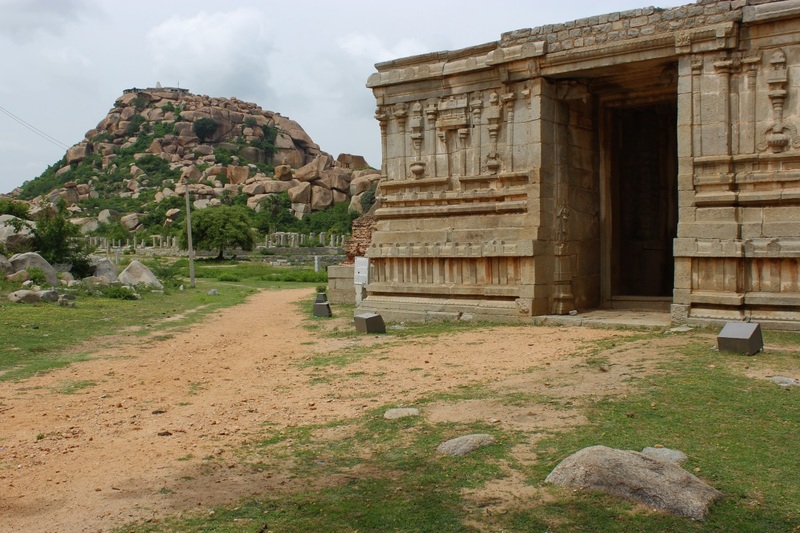 Looks like a Gopura was never built for this temple. For a gateway of this size, the Gopura would have been at least seven storeys high. That's the temple as seen through the gateway. Its a simple structure. 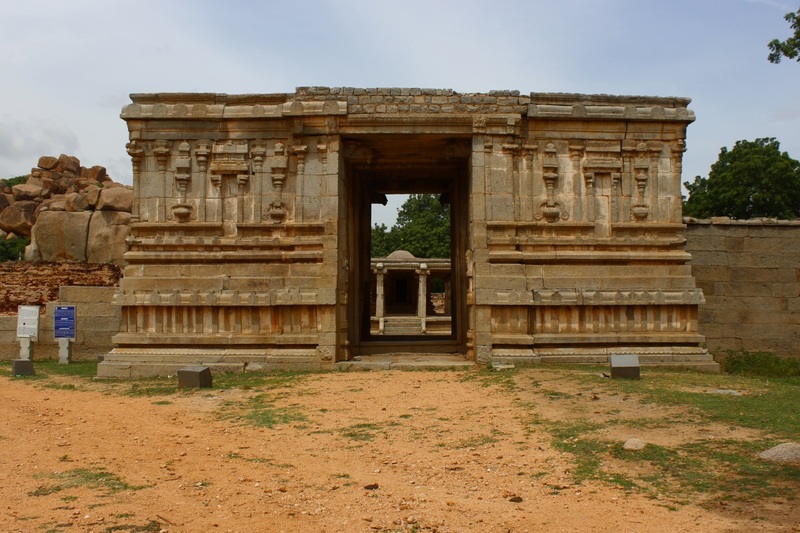 The basic design is similar to the main temple inside Virupaksha temple complex. Ouside is a signage which gives a brief description of this temple..
Popularly known as Varaha temple because of the Varaha royal emblem at the eastern entrance, this is a unique Saiva temple built inside a well laid rectangular Prakara. 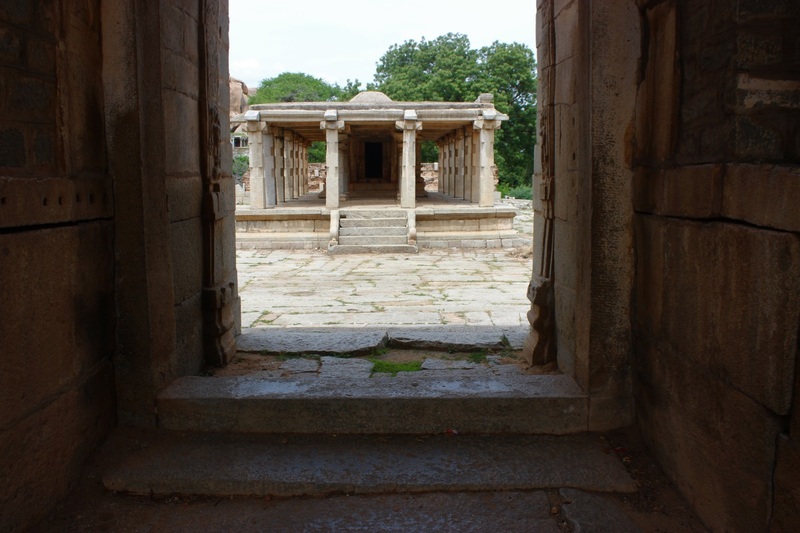 The entire temple is constructed over a Jagati with a sanctum, vestibule and a open Mukhamantapa. 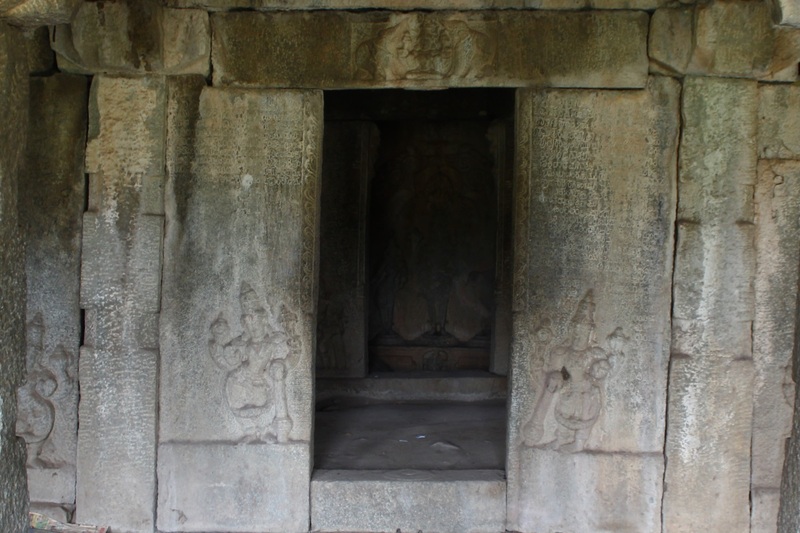 The wall portion of the sanctum and vestibule are treated with Devakoshtas. The entrance of vestibule is treated with Gakalakshmi at lintel and four armed Saiva-Dwarapalas at the door frame. Inside the vestibule is placed a couchant bull. 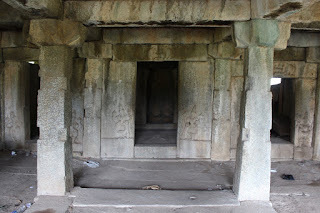 The Yashoda Krishna, Ganesha, Makara, Hamsamithuna, Peacock, Sivalinga, Nandi, and various geometrical designs like Sarpbandha, creeper etc. The raised Jagati also acts as a Pradakshinapatha around sanctum and vestibule. 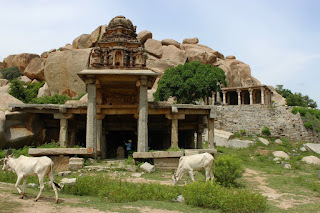 In between Kodandarama temple and Varaha temple is another temple. Its design is unusual and quite interesting. The temple is adjoining a rock formation. 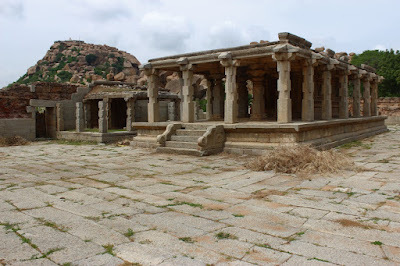 It has a high porch, a Shikhara supported by four tall pillars. The temple's interior is quite plain and its ceiling is quite low. At the entrance, on the left hand side is the rock formation. The rock face has a beautiful image of reclining Vishnu. I'm guessing this temple is either dedicated to Vishnu or his avatar Rama. This is the Sabhamantap ..simple and spacious. 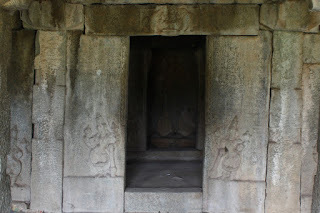 At the center is the Garbhagudi with Pradakshinapatha. The Garbhagudi. 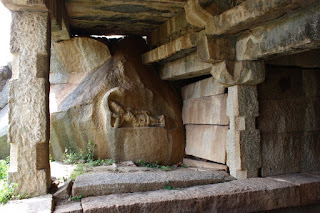 The deity is a monolithic sculpture depicting three characters.. it could be Sita, Rama and Laxmana. Or it might be Vishnu flanked by Laxmi and Padmavati. 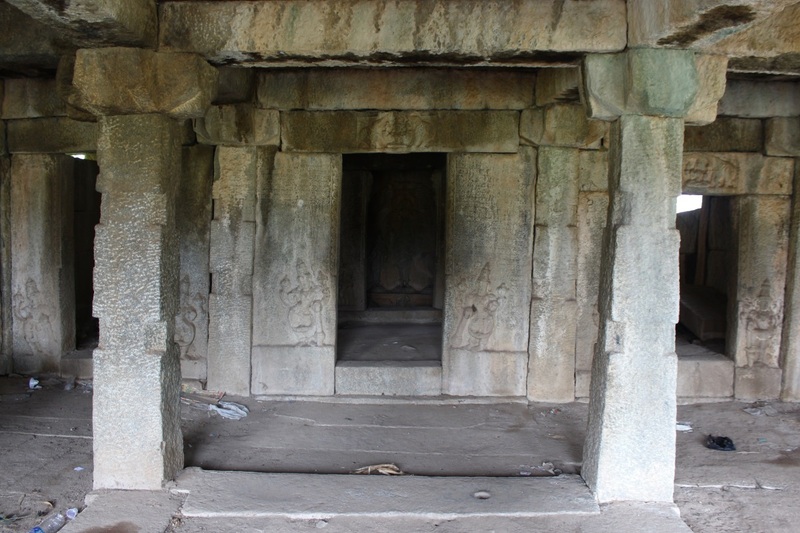 On the walls of the Garbhagudi are two inscriptions, one each on either sides of the entrance. 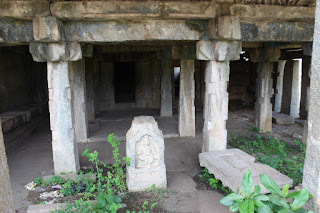 This little temple is unique and interesting but sadly its in a neglected state. Wish its cleaned up and the authorities post a signage about it.